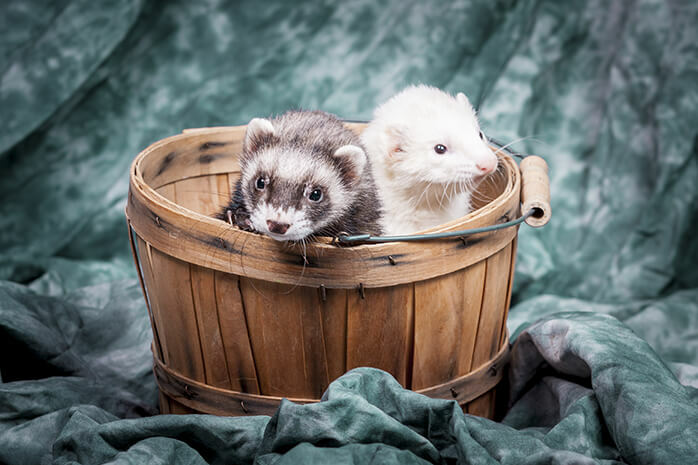 Originally ferrets were bred and kept as workers. This was because they can be trained. And it is just as true for ferret pets. They are intelligent and social animals that respond well to training, when it is done in the right way. And training your ferret is doing it a kindness because it learns how to live in harmony with you. This is particularly important for nip training and toilet training. But other skills, like coming when called, are also very useful. Using the right type of training is very important, and will save a lot of time and effort. The easiest way to recognize training types is by asking, “Am I trying to stop a behaviour?” Or “Am I trying to cause a behaviour?”. The answer to these questions will decide how to approach training. Common behaviours that you might want to stop are toileting in the wrong location, or nipping. Popular behaviours to cause are coming when called, and tricks like sitting or rolling. There should never be a need to use negative reinforcement training, such as punishment, when training for behaviour that you want to cause. Even when training to stop behaviour, negative reinforcement should be used sparingly and less often than positive reinforcements like rewards. Because training your ferret to do something is done on your own terms, there are many options and things to consider. 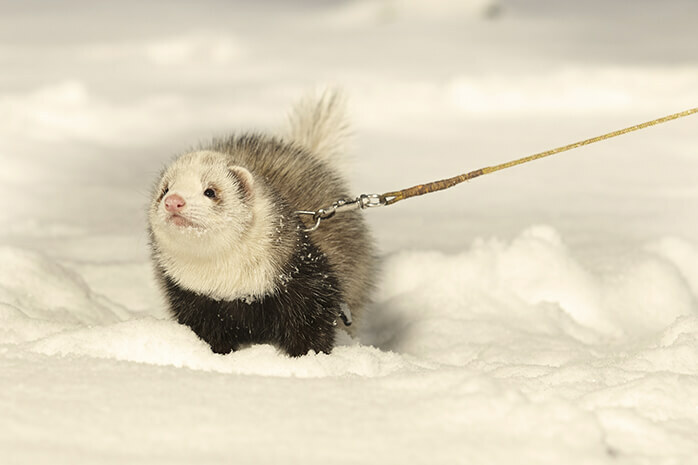 Often this training is less important than training a ferret to stop doing something. So always keep in mind the purpose of your training and make sure it is a pleasant experience for both you and your ferret. Just like people, ferrets are better learners at some times than others, and like us, they are easily distracted. This doesn’t mean you need to set up a ferret classroom and schedule, and no, ferrets don’t like uniforms either. But it does mean you need to pay attention to the environment so that it is not too distracting. And be conscious of your ferret’s mood. Too excited, like as soon as they come into their play area, or too tired, like bedtime, won’t work well for either of you. When beginning to train new skills, use the same location to reduce distraction and help reinforce the memory process. Only once training is becoming fixed, try new locations. 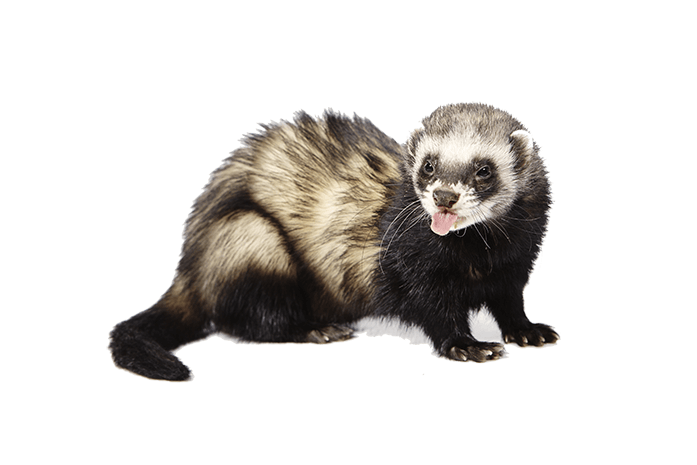 But eventually make sure that your training is effective everywhere because a ferret can associate behaviour with a location. A little bit of hunger can make a treat more attractive, but if your ferret is too hungry, they will be less able to focus on training. This is especially true when doing nip training. It is also important to be regular with your training. 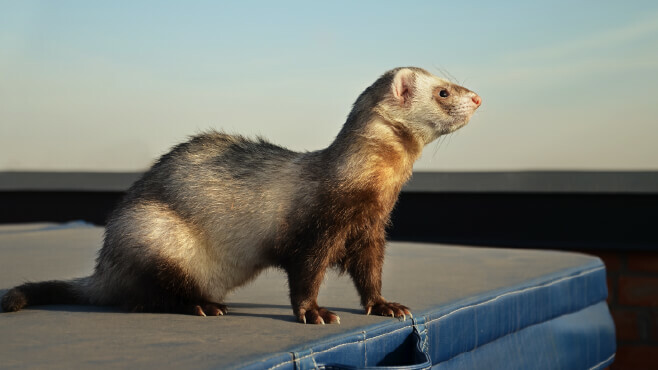 Memory fades for ferrets just like it does for us, so more than once a day is good, but at least daily during the initial training is usually best. But don’t train for too long. Pay attention to how your ferret is responding, and let that guide your sessions. The impact of a reward can fade fairly quickly during a session too, and it is hard to train once interest in the reward is lost. You might find that five to ten minutes per session works well. Also pay attention to how well training is remembered between sessions, and keep the lapse between sessions short enough so that you benefit from the memory still being active. The very first thing you need to do is teach your ferret that behaviour can be rewarded. But to do this, the positive reinforcement needs to be given immediately after, if not during the good behaviour. This can’t be done with most types of rewards, so it is necessary to create a training tool. This can be a clicker, or a squeaky toy, or something else that makes a regular and unique sound that will grab your ferret’s attention. 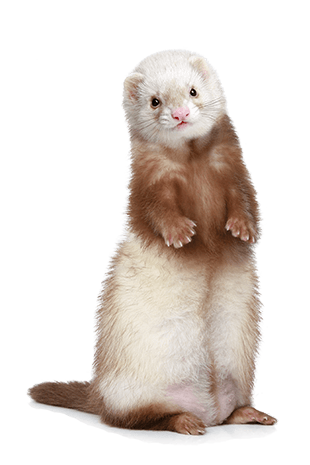 If your ferret is deaf, a visual stimulus may be appropriate. Begin by creating a very strong association between the sound and a particular reward. Do this simply by handing out a healthy treat immediately after making the sound. Make sure the treat is tiny, because it is about the pleasurable experience, not feeding. It will take a lot of repetition over many many sessions to build a powerful association with the sound. But getting this right will make everything else easier. Always remember, the training sound needs to happen as soon as possible after the desired behaviour. Taking too long makes it too hard for the ferret to know what the reward is for. Too long can be as short as a few seconds. Time flies in the ferret world. Only once you have your training tool working well, you should teach the first trick, coming for a treat. 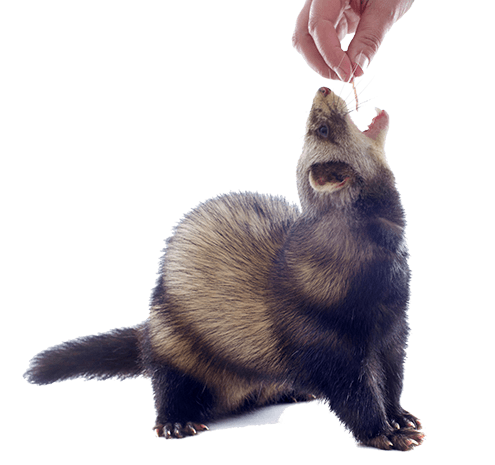 Because your ferret already wants the reward and has been trained to expect it on hearing the specific training tool sound, simply making the sound should be enough to grab your ferret’s attention, and attract them to you. Then offer the reward as usual. By training your ferret to come for the sound, you’re also training your ferret to give you attention. And having your ferret’s attention is an important part of training. This first trick is then a useful tool to gauge how receptive your ferret is before starting other training sessions. 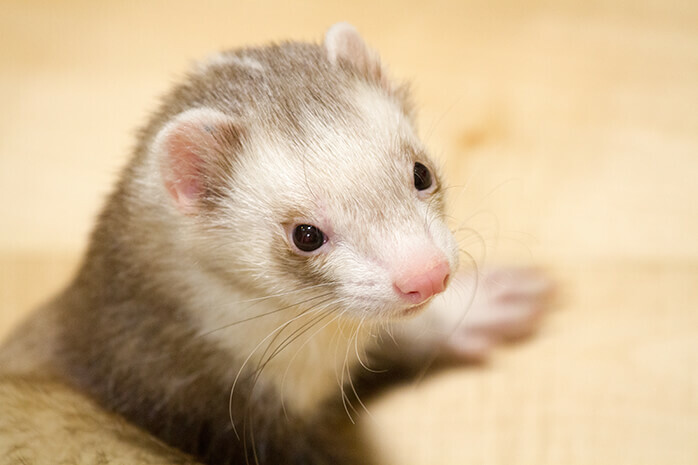 While it is easier for a ferret to recognize the training tool, they are also able to learn words and respond to them. Once your ferret has learned to associate a word with a behaviour, you won’t need to use the tool as well. This way you can transfer trained behaviour for the click into a command. 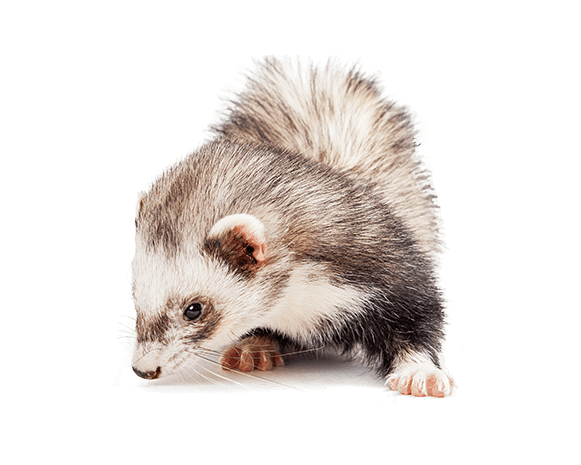 Try calling your ferret by name, then using the training tool, then calling again in quick succession. Your ferret should come at the sound of the training tool, but start learning to come by call. After a few successful training sessions, try dropping off the second call. Once they start responding to the call, try delaying the training tool sound some more. See if your ferret comes just because they expect the training tool to sound next. 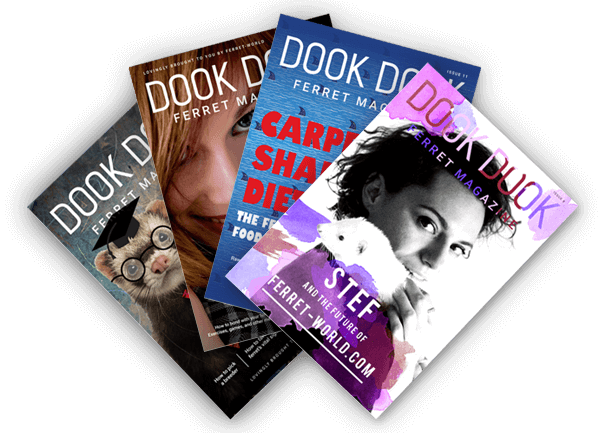 Eventually, you should be able to just call your ferret. But make sure you continue to reinforce responding to your call in some positive way, even after training is complete. It is not possible to train complex behaviours all at once. And an attempt at something can be as good as success when handing out rewards. Because what you’re training your ferret to do is to try and do the task, not only succeeding. 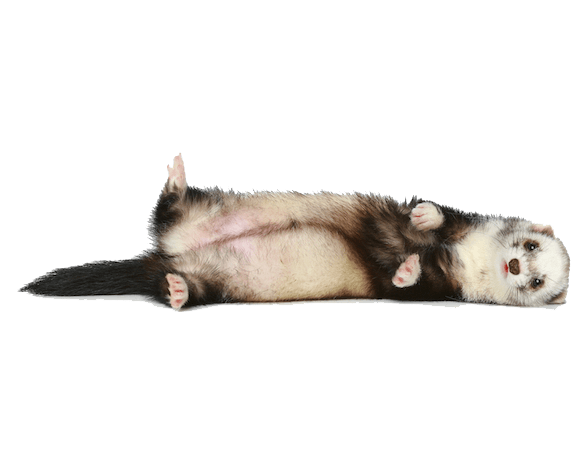 If you were training your ferret to roll over five times, when you said roll. You would start by rolling your ferret, or getting them to roll as they turn for a treat, while using your training tool and saying “roll”. Then when your ferret rolls you’d instantly reward with the training tool and say “roll”, then pass over the treat. Even if you were sure the ferret just rolled for their own fun, and had no clue it would be rewarded. Eventually your ferret will associate rolling once with the training tool and your command “roll”. Once you have achieved this, you can reward more rolls and stop rewarding less rolls until you get to the desired behaviour. This method of rewarding any step towards the final outcome works with all types of training. Ly, poly, nopoly, monopoly. You might be amazed at how much easier that is for a child to do than trying: mon, monop, monopo, monopoly. And it is just the same for ferrets. So if you’re graduating your ferret to advanced class for complex tricks like bringing you your toy, start by training the last part of the trick first. That would be accepting the toy from the ferret. 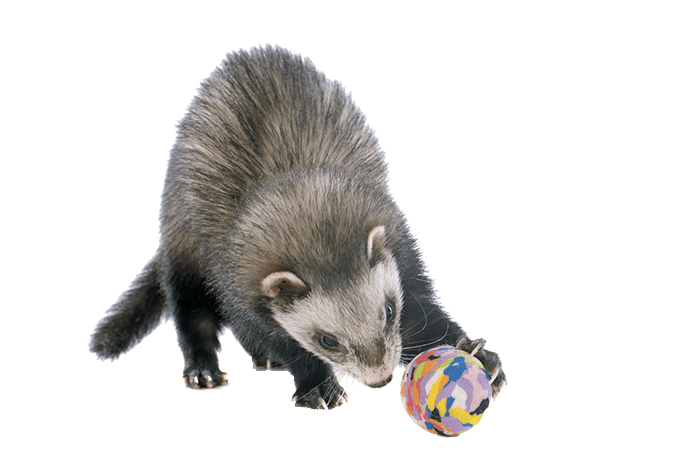 Then proceed to having your ferret come to you when they have the toy, followed by accepting it. And build backwards from there. Training your ferret to stop doing something can be much harder than training a response or action. It will require you to be very attentive, so that you can also be very consistent. When possible, this means noticing behaviours that occur before the bad behaviour, preventing or interrupting the bad behaviour with a “no” event, and using the same negative stimuli for the bad behaviour. It also requires noticing and rewarding the good behaviour every time as training progresses. The best way to say “no” to a ferret is in a language that it understands. So mimicking what ferrets do with each other can be most effective. Two popular behaviours to say “no” are scruffing, and hissing. Scruffing is where you pick up your misbehaving ferret by the nape of the neck and hold them for a moment, or to show dominance drag them over the floor for a short distance. Hissing is simply recreating the sound that other ferrets use to say “no”. Hissing can be especially effective because, like the training tool, it can be done instantly when unwanted behaviour occurs. Also try blowing in their face to immediately stop their behaviour. Be careful, especially with nip training, that your “no” cannot be misinterpreted as play or act as a reward. Sometimes further negative reinforcement might be required, such as time out in a specially chosen location, that is no fun, but safe. Just make sure that this location is not their safe place to sleep, or their safe way to travel. It will become associated with a negative experience. 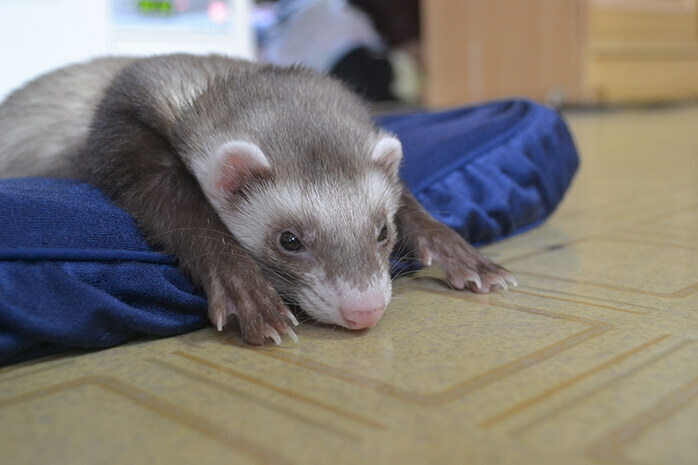 Make sure that it is never distressing or harmful for your ferret, and keep the duration very short because your ferret will soon forget the reason behind it. When trying to stop bad behavior make sure that you have created many opportunities for the good behavior. So if you’re toilet training your ferret, provide plenty of litter trays in the corners and preferred places to go. Then reward your ferret instantly with the training tool for going to these places. Even going there, but not using it can be rewarded because the behavior is going in the right direction. Or if the behavior is to stop chewing the wrong things, make sure there are plenty of the right things to chew. Do your best to notice the good behavior so that you can reward good behavior more often than punish bad behavior. Positive reinforcement is the most effective, and the kindest. There is More to Life Than Treats, Yes More! Treats are a very easy to use tool for training, and when combined with your audible training tool, can be very effective. But make sure that the treat is healthy, and remains healthy in the quantity that you’re giving it out during training. 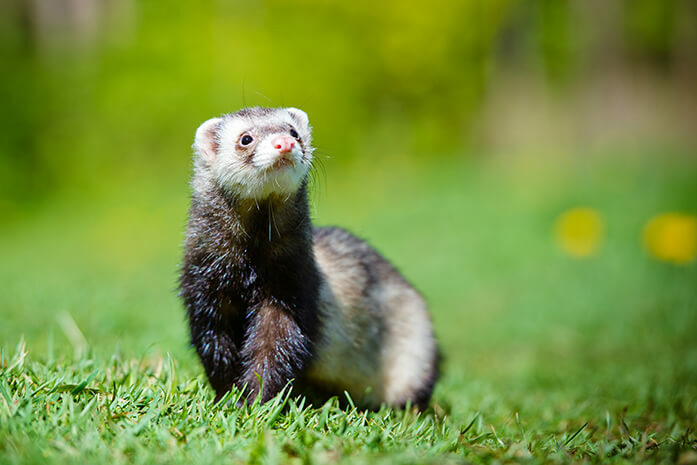 Ferrets are meat eaters, and many other food types can cause problems, so keep this in mind when selecting a treat. To keep the treat powerful, use it exclusively for rewarding. And look for other ways to reward good behaviour. This is even easier once the main training has been completed and you want to keep reinforcing it. Other rewards can include a new toy, access to a new area, physical interaction and adoration, playing games and more. Still use your training tool to mark the good behavior and set up expectation of a reward. Just swap out the reward for something other than food. Having a variety of rewards can be even more important during socialization training. This is the process where you help your ferret to become comfortable being handled, introduced to new people and new experiences without reacting in a fearful or aggressive way. Sometimes you can just tell when your ferret is trying hard or being brave. Recognize this effort with the reward tool’s sound and a treat. And through these experiences, your ferret will be more skilled at fitting in with your life, and you’ll have a ferret that brings more pleasure and less frustration to you.